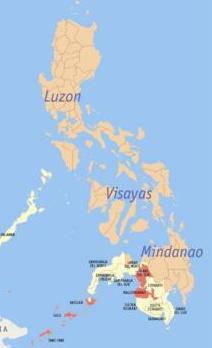 The Autonomous Region in Muslim Mindanao, (ARMM) is the region of the Philippines that is composed of all the country's predominantly Muslim provinces, namely: The Provinces of Basilan, Lanao del Sur, Maguindanao, Shariff Kabunsuan, Sulu and Tawi-Tawi, and the Philippines' only predominantly Muslim city, the Islamic City of Marawi. It is the only region that has its own government. The regional capital is at Cotabato City and an annex is also maintained in Zamboanga City, although these cities are outside of its jurisdiction. Geographically, the region is divided into two geographical areas – the Mindanao mainland and the Sulu Archipelago. Lanao del Sur, Maguindanao and Shariff Kabunsuan are situated in the Mindanao mainland, while Basilan, Sulu and Tawi-Tawi are located within the Sulu Archipelago.